Speech is never free. A lot of the time we bite our tongue, take a minute and rethink what we want to say. We massage the message. From an early age we are taught to mind our manners… mind our tongue as though our tongue were an unruly dog that we have on a choke chain. Just when our tongue is about to run away from us, we yank on the chain and those little barbed spikes bite into our neck. Try writing a piece in which one of your characters, is minding his tongue. Begin thinking of a conflict that leads to two people arguing. Type your dialogue as usual, but when you write the internal dialogue of the person who is thinking one thing but saying another, signal the shift by typing that person’s thoughts in italics. 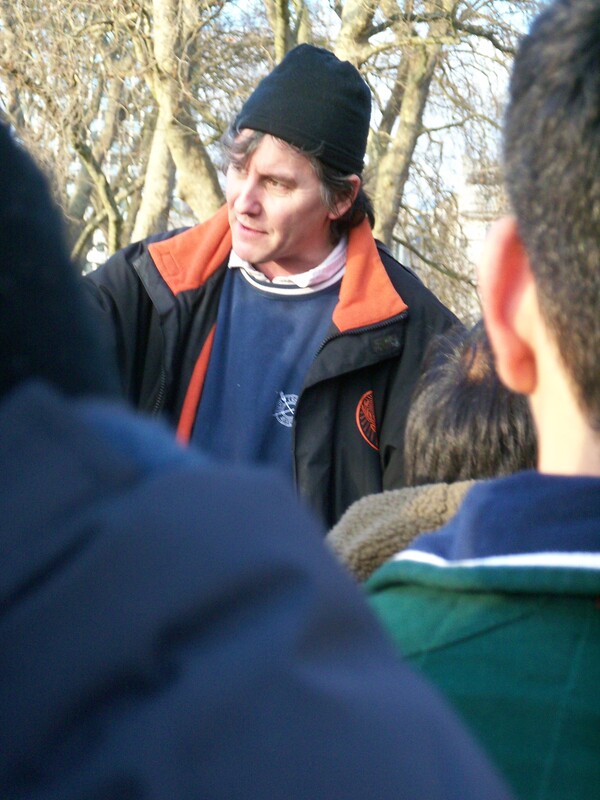 Speakers’ Corner in Hyde Park is always worth a visit. Sunday is the best day to go. The speakers are a varied lot. Some bring stools; others bring ladders. If you are going to speak, it is good to stand above the crowd so your voice will carry. A megaphone or a bull-horn is a nice addition. The speakers come in all shapes and sizes. The only thing that brings them together is a need to share their beliefs. Doing so is not for the faint-hearted because the hecklers are there in force. The din can be deafening. A fair number of speakers will be proselytizing. We are all going straight to hell if we don’t pay attention and believe. As to what we should believe, we have choices. Any number of religions are on offer. Expounding on politics is the second favorite thread. Iraq, Iran, Afghanistan, Israel, and Palestine are always on-tap. Today, Egypt and Mubarak were hot topics. America takes a lot of flack. Not to say that I can’t get on a rant myself, but I do get very tired of the United States being the fall-guy. Regardless of the topic, American’s hand is seen to be pulling the strings. 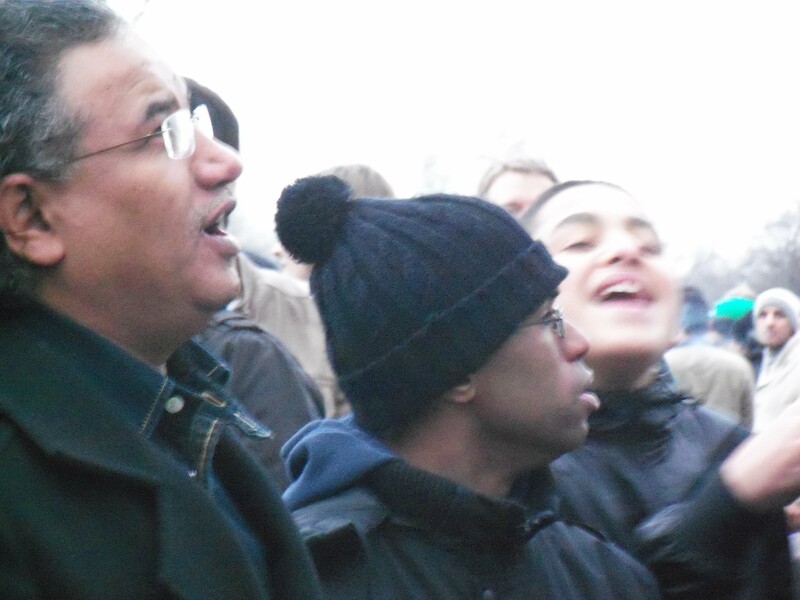 So there is a lot happening on Speakers’ Corner. It is democracy in action, and it is loud and messy. Meanwhile, in Parliament Square, speakers are also having their say, but there on the green space in front of Parliament, loud and messy is unsightly. Placards and protesters have always shown their colors on the green across from Parliament. 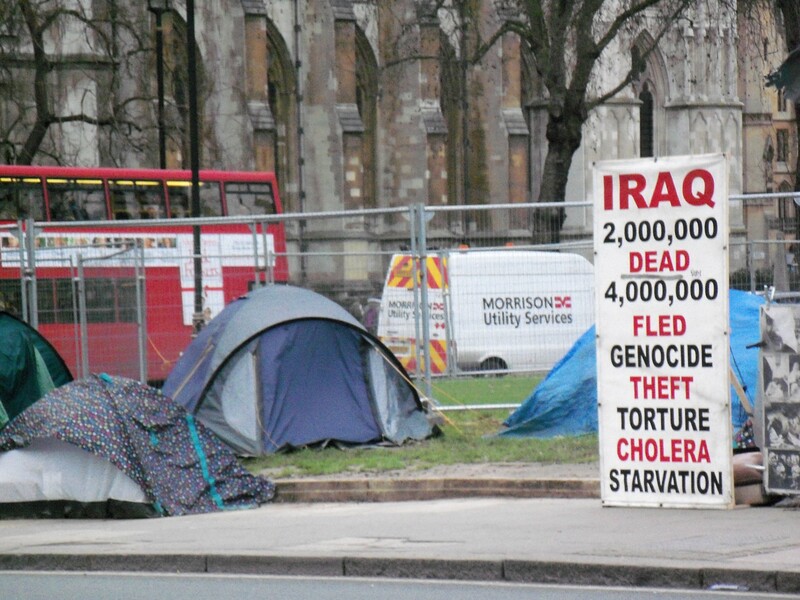 But about nine years ago, anti-war protester Brian Haw set up camp. Unlike the others (the anti-war , climate change, and fathers’ rights activists who held court during daylight hours), Haw brought his tent, his sleeping bag, and for all I know, his porta-potty. Over time more people joined Haw. A regular tent city sprang up on the Green. 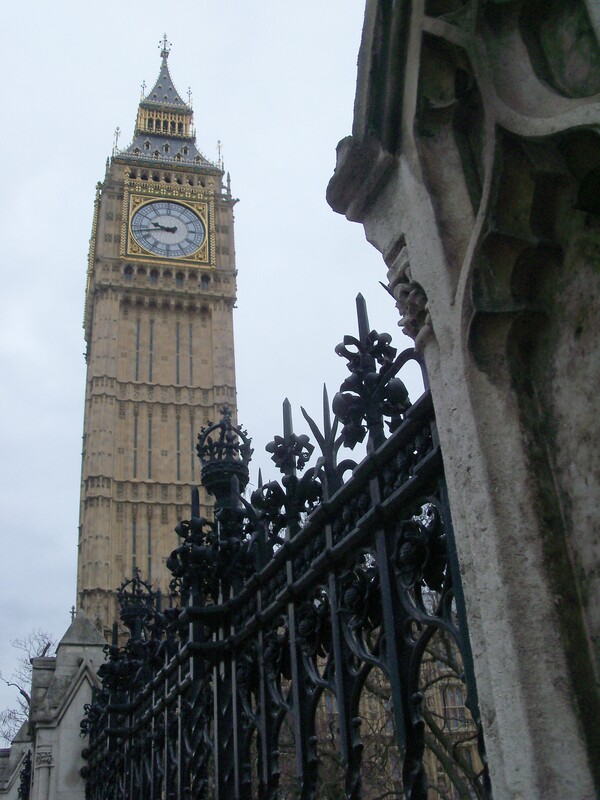 On July 20, 2010, the Greater London Authority cleared the tents from the Green. Undeterred, the tent city moved to the pavement that surrounds the Green. To assure that the campers did not return to the greenspace, the GLA erected a chain-link fence. At which point, the campers moved to the pavement enclosing Parliament Square which is controlled by another entity, Westminster Council. The council will argue that the campers are guilty of “wilful obstruction,” and that the tent city impedes foot traffic – a pretty lame claim in that there are no crosswalks that lead to Parliament Square. To cross the roadway would be to take your life in your hands. And with the square itself fenced off, why exactly would you want to reach the sidewalk surrounding the perimeter? The issue is in the courts, and Prime Minister David Cameron is biting his nails. The Royal wedding is April 29. The car carrying Kate Middleton to the abbey will drive past the camp. and after the marriage, Prince William and his lovely bride will ride round the square in an open carriage. Needless to say, the cameras will be rolling. What will people think when the cameras pan to catch the camp? 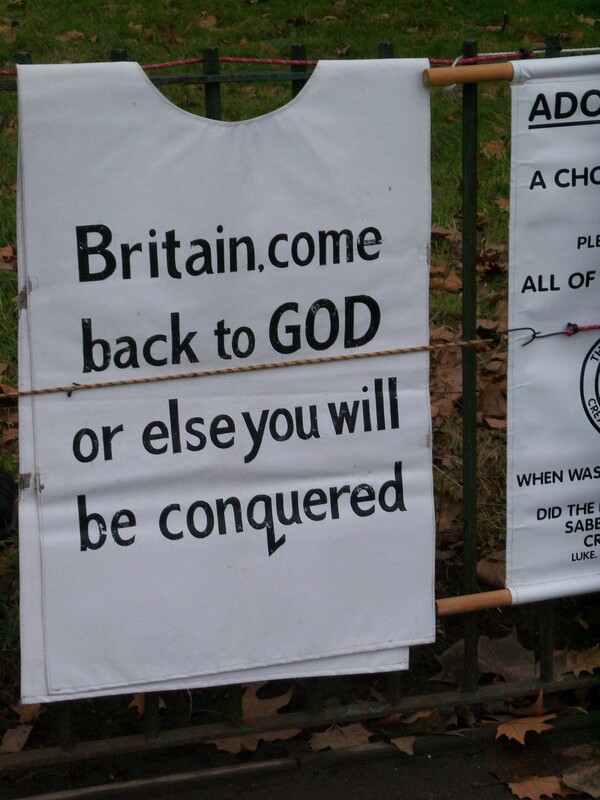 Not only that, but will the encampment deter tourists who might be thinking of coming to London for the 2012 Olympics? Will people see a blight on a heritage landscape or will they be seeing democracy in action? The jury has yet to rule.